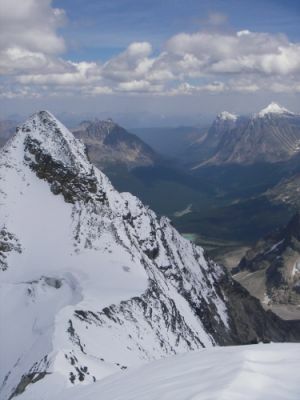 This peak is #87 on the Height List for Alberta .Located in the Ramparts of Jasper National Park. First ascended in 1926 by R.B.M. Bibby, J.H. Hoag, N.W. Spadavecchia. Journal reference CAJ 16-66, App 20-536. Name Notes: This peak was named after Bennington, Vermont, the birthplace of Simon Fraser. It was named by Arthur O. Wheeler in 1922.